Peppermint (Mentha x piperita) is a hybrid herb, a natural cross between spearmint (Mentha spicata) and watermint (Mentha aquatica). Thanks to its unique and refreshing aroma and flavor, peppermint is a popular ingredient in toothpaste, chewing gum, and mouthwash. Besides acting as a flavoring agent, peppermint has been widely used in folk medicine and aromatherapy. Peppermint is considered to be a great source of vitamin C, copper, and manganese; two fresh peppermints can deliver five percent of the recommended daily value of manganese, and three percent of the recommended daily value of vitamin C and copper. 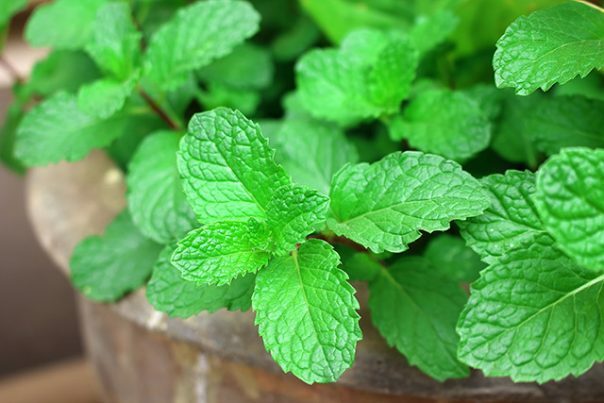 Peppermint can serve as a natural remedy for colds thanks to its menthol content. This organic compound thins mucus and expels phlegm, thus easing congestion. Additionally, topically applying peppermint opens up the pores on the body and allows heat to escape. Those experiencing muscle pain can turn to peppermint for relief. Peppermint has stimulating, anti-inflammatory, and analgesic properties that make it effective in soothing inflamed muscle tissues, like a sore back or even menstrual cramps. In addition to freshening up breath, peppermint can prevent bacterial growth in the mouth. With less bacteria, the likelihood of developing tooth decay, gingivitis, and other oral conditions decreases. Note: although largely beneficial, peppermint can be harmful to certain people. Individuals who suffer from diabetes, regularly take antacids, or have hernias are advised against taking peppermint. Peppermint is good for the digestive system since it can act as a carminative, or a drug that relieves flatulence. Moreover, peppermint can relax stomach muscles and improve bile flow, helping promote better digestion. This herb can aid the skin in a variety of ways — its anti-inflammatory and antioxidant effects can reduce acne and sebum production, while its soothing and calming properties can relieve itchy or infected skin. Peppermint is more common during the holiday season, where it can be baked into cookies, cakes, and candies. Outside of the holidays, peppermint does well when brewed into a tea, which can then be taken to soothe upset stomachs. Peppermint is also available as an essential oil. Rubbing it onto affected areas or even just it can help the body. Peppermint acts as an average antimicrobial, antioxidant, antiseptic, antispasmodic, and carminative agent. The muscles, digestive system, and skin can benefit greatly from peppermint, especially if they are inflamed.